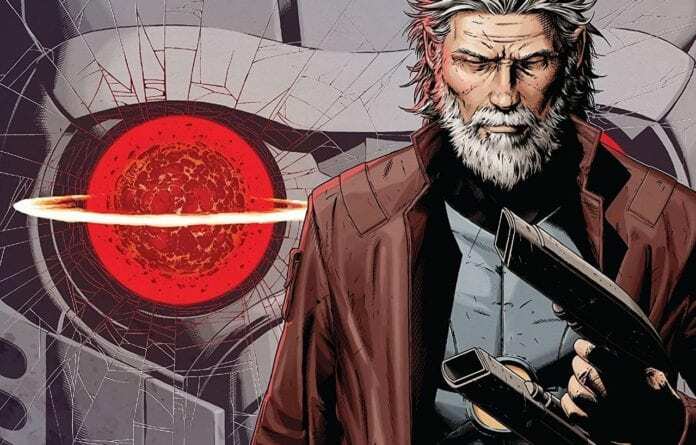 Hot off the success of Old Man Hawkeye, Marvel enlists writer Ethan Sacks to tell another story for the growing “Old Man Superhero” brand. 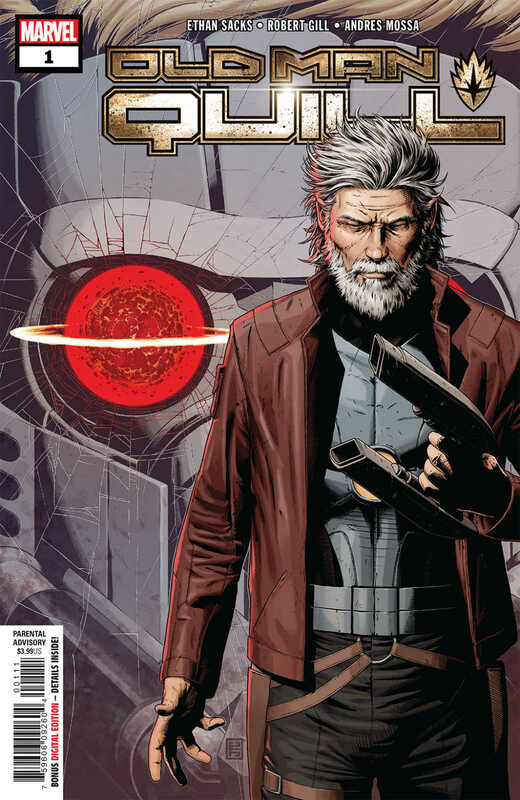 OLD MAN QUILL #1 shows us the future of the Guardians Of The Galaxy for this timeline. We open with a younger Peter Quill who’s assumed the role of Spartax Emperor from his father. He’s got a little family back home as he leads an assault on the Universal Church Of Truth. His “military genius” was for naught and the world he’s sworn to protect falls, along with his family. Now an old man, Quill is broken and unable to move on. Our story begins when his former galaxy guardian allies come to drag him back into a fight against the Church. 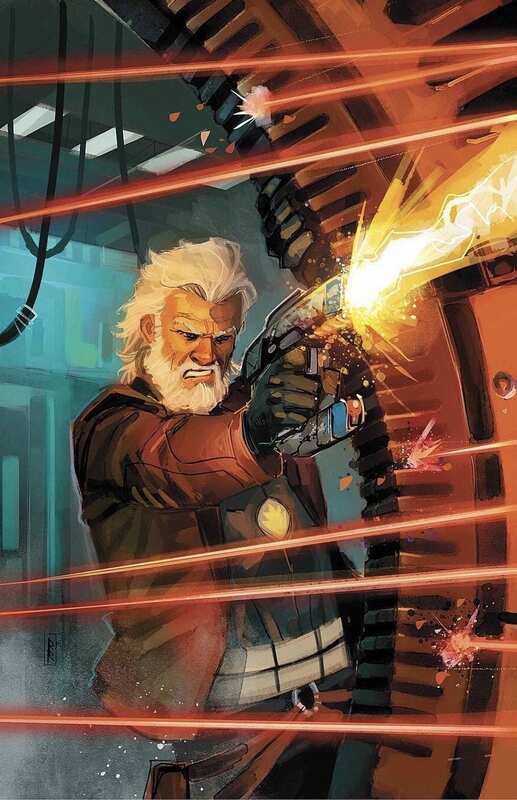 Much like the Hawkeye and Logan installments in the “Old Man” brand, Old Man Quill is tragic and oddly satisfying. One of the strongest elements of Ethan Sacks’ fantastic Old Man Hawkeye was that it was the Hawkeye of old. The Clint Barton we remember from pre-Matt Fraction era Marvel comics. Sacks looks to revisit the same formula with Star-Lord, his Quill is much more Abnett/Lanning than post-Chris Pratt Quill. Seeing the wear and tear on Drax, Gamora, Rocket, and Mantis is delightful. Mantis has an especially interesting dilemma in her older age, being overloaded with too many memories and feelings from over the years. These are the kind of details that Sacks is particularly great with. The book’s biggest strength is Sacks’ voice and appreciation for these characters; he utilizes the timeline sandbox that he’s creating in. The biggest weakness in this first issue is the plot itself. Quill is scooped up to “save the galaxy” from the Church, but then we’re investigating a distress call? Then the Milano is blasted and crash lands. Where the Milano and it’s crew crash lands is our shocking twist ending that I didn’t see coming. Throwing these lovable old Guardians into the Wasteland of Old Man Logan/Hawkeye could make or break this book. In the past, when the Guardians are stranded on Earth, it’s a bore. It limits and dulls the characters to not have them in the extremes and outrageousness that the 616 cosmos provide. Perhaps it will be different given that it’s the Wasteland and not just another Civil War for them to be props in. Artist Robert Gill channels the Abnett/Lanning glory days as well. These look like the Guardians of that era have been aged, even with Emperor Quill sporting his current armor. Gill does a wonderful job adding appropriate wear and tear to each of member of the team. Gill’s aging and expressions with Quill himself are fantastic. The pain behind his eyes, the anger in Rocket’s, the sadness and disappointment in Gamora’s. Shredding through a Brood swarm with this gang of geezers shows that they’ve still got it but are definitely not at their peak still. Old Man Quill #1 may end up being the most fun of the “Old Man Superhero” brand. Marvel was smart for recognizing that Ethan Sacks clearly has a vision for this particular stories and once again paired him with a fitting creative team. Another trip to the Wastelands makes for an exciting premise, this opening chapter may lack a detailed script but more than makes up for it in character. Also there will be DOOM and you can never go wrong with Dr. D. That Mt. Doommore was a glorious and promising sight.